a fight for law and order, whenever bad guys needed a lesson taught. Boyd didn't sing, dance, or play football. 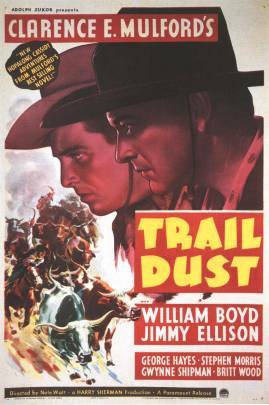 Boyd was merely HOPALONG CASSIDY. He smiled, waved, and shook hands. He was simply...everybody's favorite cowboy...Hoppy! William Boyd was born in Ohio in 1895 the son of a day laborer. When he was seven his family moved to Tulsa Oklahoma. When he was still in his early teens, his parents died; forcing him to quit school. He worked as a grocery clerk, surveyor, and oil field hand. When he went to Hollywood in 1919, he arrived with an already beautiful head of prematurely grey hair. Then in 1935, a producer named Harry 'Pop' Sherman got lucky and convinced Paramount to release a series of westerns novels and short stories authored by Clarence E. Mulford...HOPALONG CASSIDY. As written, Cassidy was a crude, crusty ranch hand and definitely not intended as a Saturday Matinee hero. Boyd, was ultimately cast in the part and it was decided between himself and "Pop" Sherman that he would not play the character as written. In his first entry in the series, Boyd plays the character with a few rough edges, all of which would disappear in future films. He starts out as "Bill" Cassidy but acquires his nickname when he is wounded in the leg in a gunfight and when asked about his wound, he responds with something like "I'll manage to hop along". By 1944 Boyd and Sherman had made 54 "Hoppy" films. For the next two years or so, Boyd and Hoppy were off the screen. 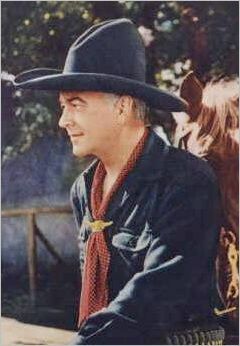 During this time, Boyd sold his ranch and almost everthing he owned to purchase the rights to the films and character. He also formed his own production company to resurrect the Cassidy cinema adventures. Brand new Hopalong flicks hit the silver screen during 1946-1948. But this was post World War II time --- film production costs had skyrocketed, people's movie tastes and habits were changing, and the B western was fading. Then a newfangled gadget called television arrived to save the day, and the end result was a significant financial windfall to Boyd. The Hopalong Cassidy films became a network broadcast over NBC, and early Sunday evenings became 'Hoppy night'. The ratings for the one-hour Cassidy program were solid. For the 1952-53 and 1953-54 seasons, there were 52 half-hour Hoppy adventures. A dozen were condensed from earlier films, and 40 brand new half hour shows were produced. The result of all this was that Boyd and the Hoppy character became more popular than ever. 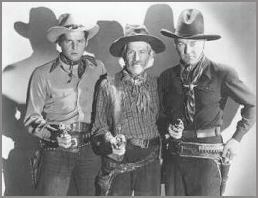 The public clamored for more HOPALONG CASSIDY and Boyd complied with their demands. His popularity was astounding. He received 15 thousand fan letters a week and endless requests to make public appearances. Bill Boyd's television success has never been rivaled. As to William Boyd the man, he had gone through a personal transformation and re-awakening. In addition to TV, Boyd met his fans at circuses, rodeos, hospitals and personal appearance tours. He also brought the Hoppy series to radio; he opened up his own Hoppyland theme park; and had long running series of comic books. Hopalong Cassidy merchandise included hats, gunbelts, lunch buckets, clothing and more. He was on the covers of magazines such as Life, Look and TV Guide. Over the years, William Boyd --- and his version of the Hopalong Cassidy character --- blended together to become one and the same. Boyd and Hoppy bacame a role model and the parents of the time loved him for it. Many kids who grew up in the late 1940s and early 1950s owe some of their personal values and beliefs to William Boyd. That's his greatest accomplishment. He was in his sixties by this time, and he personally felt that the Hoppy character could not be properly portrayed at this age. He was also feeling the pressure of being before the cameras month after month. Boyd was reluctant to retire because of his loyal fans and the knowledge that his large production crew would be put out of work. Fortunately, CBS was about to start shooting the series, GUNSMOKE, and Boyd was able to turn over his company to that network, assuring employment for his entire crew. The year before he retired, he made 40 Hoppy episodes in as many weeks and one more world tour. Completing that tour, he put his horse out to pasture, hung up his guns, took off his boots, and said adios to HOPALONG CASSIDY, his alter ego. He retired to Palm Desert CA. In 1968 he had surgery to remove a tumor from a lymph gland and, from then on, refused all interviews and photograph requests. Boyd died in 1972 of heart problems and parkinson's disease. 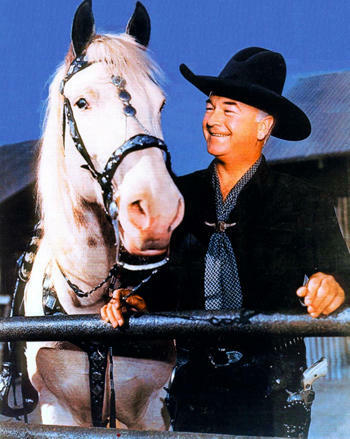 - The name of Hopalong Cassidy's white horse was "Topper." - Boyd was Cecil B. DeMille's first choice for Moses in 'The Ten Commandments' but he turned the role down, fearing the Hopalong Cassidy identification would hurt the movie. - In an early movie Hoppy kissed Evelyn Brent on the forehead as she was dying. His fans saw this as unmanly, so all future romance was left to his partners and there was a different leading lady in each picture. Memorabilia, Collectables, Books, Movies, Posters, etc. < < < trail BACK to Cowboy Heros . . .